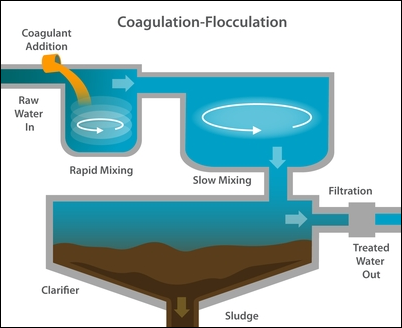 Flocculation is the operation in which the coagulated water must be gently mixed at a propeller speed of 15 to 20 rpm to promote the growth of the floc. Slow mixing is resorted to agglomerate the floes to grow to sizes in the range of 0.1 to 2.0 mm that can be removed by sedimentation. Slow mixing is the hydrodynamic process, which results in the formation of large and readily settle able floes by bringing the finely divided matter into contact with the micro-floes formed during rapid mixing. These floes can be subsequently removed in clarifier and the residues in filters. Flocculation typically lasts for about 30 to 60 minutes. The flocculation basin often has a number of compartments with decreasing mixing speeds as the water advances through the basin. This compartmentalized chamber allows increasingly larger floes to form without being broken apart by the mixing blades. Macro floes are the end product of a well-regulated coagulation and flocculation process by converting and forming clusters of majority of the turbidity causing particles, clumps of bacteria and particulate impurities. The floc will then settle out in the sedimentation basin, with remaining floc will be removed in the filter. The best floc size for settling is 0.1 to 3 mm. Larger floc does not settle as well and is more subject to breakup in the flocculation basin. Smaller floc also may not settle. Slow mixing is meant to bring the particles to colloide and then agglomerate. The rate of collision among the particles is dependent upon the number and size of particles in suspension and the intensity of mixing in the mixing chamber. The horizontal flow flocculator consists of several around the end baffles with in between spacing of not less than 45 em to permit cleaning. Clear distance between the end of each baffle and the wall is about 1.5 times the distance between the baffles, but never less than 60 em. Water depth shall not be less than 1.0m and the water velocity is in the range of 10 to 30 cm/s. The detention time is between 15 to 20 minutes. This type of Flocculator is well suited for very small treatment plants. It is easier to drain and clean. This type of Flocculator is used for medium to large size treatment plants. In vertical flow baffled Flocculator the distance between the baffles is not less than 45cm. Clear space between the upper edge of the baffles and the water surface or lower edge of the baffles and the basin bottom is almost 1.5 times the distance between the baffles. Water depth varies between 1.5 to 3 times the distance between the baffles and the water velocity is in the range of 10 to 20 cm/ s. The detention time is between 10 to 20 minutes. Mechanical paddle mixers in a flocculation basin with a detention time of 20 to 60 minutes are widely used in practice. Mechanical flocculators, consist of revolving paddles connected to horizontal or vertical shafts, driven by electric motor. Design criteria for Mechanical flocculator are furnished below. why flash mixer is used? I have a project where the detention time in the first flocculation chamber was 3minutes and second flocculation chamber 6minutes,was this not below the recommended values for detention time in the flocculation chamber? Yes, your detention time of flocculation time is very low as per the designs. thanx but a more detailed information about operation of mechanical and hydraulic flocculators is stil needed. really u r working hard for developing the basic concept of the environment studies in the easiest manner. Thanks for very valuable information. I am Working as a Sr.Manager (Electro-Mechanical) in M/s. Ramky Infrastructure Ltd. we are on the job of 130MLD WTP at Kota under UIT Kota. Thanks for the valuable information. i will keep in touch. THANK YOU.I HAVE ALL ALONG BEEN WORKING IN BUILDING WATER TREATMENT PLANTS AND CONGRATULATE YOU FOR THAT VITAL INFORMATION. PLEASE I HAVE MORE QUESTION FOR YOU. PLEASE CAN YOU REPLY THROUGH MY MAIL,THANK YOU. I am Tigistu kebede from Ethiopia I am working in Hawassa University withe a poison of Technical Assistance(Laboratory )on Hydrology,Water and Wast Water Treatment at school of bio system and Environmental Engineering. Can you give me haw can demonstrate students in laboratory the steps of Water and Wast Water Treatment plant. I have one assignment about surfac water treatment. about flocculation tank when we design, should we consider the slop or not for horizotal flow and baffles spacing should be increasing gradually or not and how long spacing we should increase?